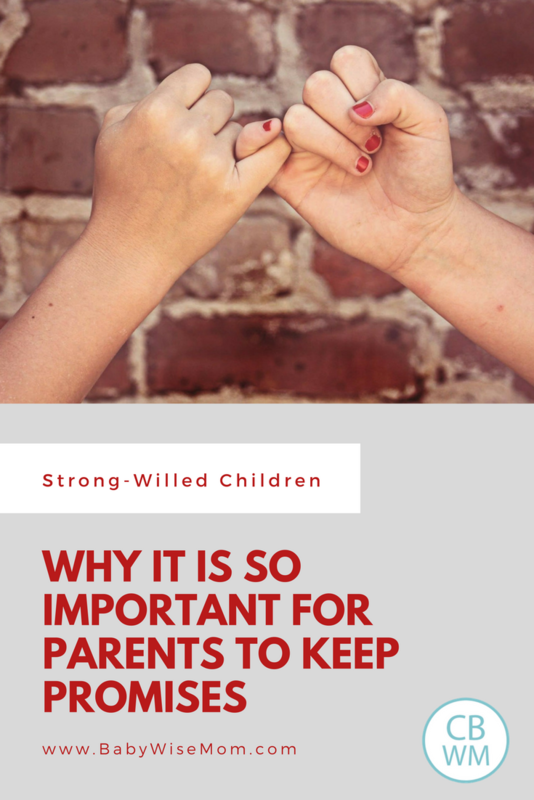 The last post I wrote from the book Parenting the Strong-Willed Child was on Building Positive Self- Esteem. I left one important thing out of that post, and that is because I wanted to dedicate an entire post to the topic. That important thing is keeping promises. Forehand and Long state on page 209 that an important aspect for building positive self-esteem is don’t make promises you can’t keep. It is difficult for a child to be told something will happen over and over only to never (or rarely) have it come to fruition. All that teaches the child is 1) don’t trust people and 2) never get your hopes up. Yes, sometimes you will promise something and for whatever reason, it won’t be able to happen. I think that is all fine and even healthy. It is good to learn to deal with disappointment. When these times happen, I think it is important to explain to the child why it can’t happen and apologize for it. I don’t think these rare instances will emotionally scar a child. It does emotionally scar a child, however, if the promises are broken more often than kept. Whether you subscribe to the idea of “self-esteem” or not, I think it is clear that being raised under this being a generality is not good for the psyche. So what can you do to avoid broken promises? I think you need to be honest from the beginning. “We are going to try to go to the Fire Station Monday. We will go unless something happens to prevent us from going.” This is an example from our life a couple of months ago. Our friend is the fire chief and we planned to go get a tour of the fire stations. I am, however, quite careful about making promises, so I was sure to explain that it wasn’t a for sure deal. I was glad I did because Sunday, a house in our community burnt all the way to the ground. The fire fighters were busy watching the ashes Monday, so there was no tour for us. Our children were disappointed, but understood the situation. So when your children ask you if you can do XYZ, don’t commit to it unless you intend to fully follow through. Again, I think the occasional inability to keep a promise is not going to be damaging. I think our kids would have been fine and understanding even if I had promised we would go to the fire station no matter what. Another idea is when you do have to break a promise, explain the reason for it as I mentioned above. If your child is old enough to be disappointed about something, he is old enough to understand extenuating circumstances. A third idea is never tell your children you are going to do something until you are on your way :). This can work, but I personally think half the fun of anything is the anticipation for it, so I do like to let them know ahead of time. So, say what you mean. Mean what you say. Only promise if you intend to keep it. It is better to say “I don’t know” and not do it than “Yes! For sure!” and not do it. If you are an example of someone who keeps their word, it will be all that more likely that your child will grow up to keep his or her word. Previous Post Poll Results: Did you drop the dreamfeed (DF) first or move to a 4 hour schedule first?